The best (and easiest) Tea Cakes Recipe (or tea cake cookies recipe) is here! You will feel like you are right in the South after making and serving these, not to mention eating them. A true southern delicacy. The traditions of southern tea cakes recipe making in my family vary. On my dad’s side of the family, southern tea cake cookies were made with molasses. On my mom’s side, they wouldn’t dream of adding molasses. The funny thing is that both sides reside in Mississippi though in different regions. You would actually think they lived states or even worlds apart based on the differences between their upbringings. I find it interesting how a couple hours drive can completely alter what is acceptable food ingredient protocol in traditional southern baking. Regardless of which southern tea cakes recipe one prefers, no one in the South can deny the crucial role tea cakes play in their heritage. They are almost part of a religious experience. 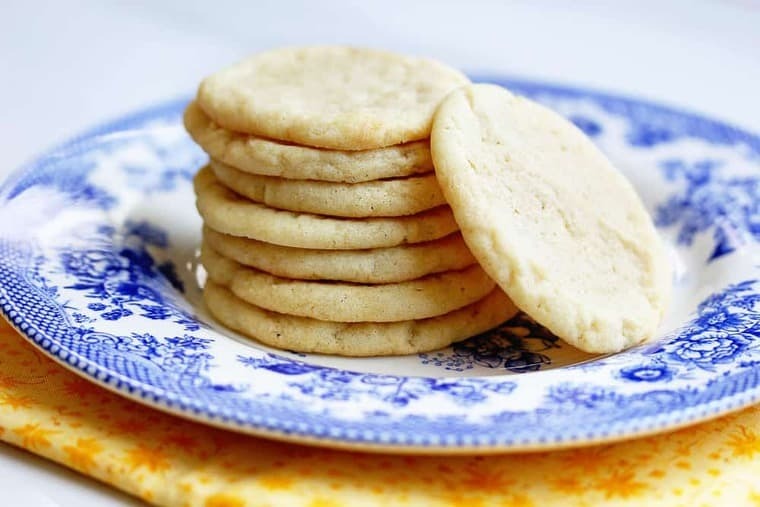 My parents both describe in great detail the remembrances of southern tea cake cookies prepared by their mothers and grandmothers and even great grand mothers for special occasions or just regular days. But what makes a southern tea cake so darn special? Southern Tea Cakes have an incredibly powerful and colorful history within the African American community. Culinary historians say the cookie may have been slaves’ version of the English tea cake. With very little supplies, enslaved Africans took what was available and made their own version. Tea cakes became a comfort food and then a special treat during the holidays. With many families migrating North at the end of slavery, many foods of the South by slaves were left behind. Families wanted to begin new traditions and leave behind reminders of oppression. But fortunately, Southern Tea Cakes were a tradition that continued through the years. Traditional Southern tea cakes are simply cookies with a pared-down ingredient list that results in a simple flavor. The term “tea cake” comes from the fact that the cookie lends itself to being paired with a cup of hot tea. Ideal, but not necessary. Don’t be surprised if you find these cookies to be a tad on the bland side. They’re not meant to be as flavorful as the layered and deliciously flavored cookies we’re used to. That does not make them any less than incredibly tasty. Some say tea cakes remind them of sugar cookies but they remind me more of a pound cake in cookie-biscuit form. These tea cakes look like simple butter cookies (which is why they are sometimes called tea cake cookies) but they have a bit more of a cake consistency. To me, they are just plain fabulous. They are buttery, rich, subtly sweet, and soft. Their bottoms are light golden brown and barely crisp, while the edges are slightly chewy. Am I making you hungry yet? Everything you love about dessert is rolled into this recipe, and you won’t believe how simple it is to make that happen. The recipe ingredients are the same as typical butter cookies but the ratios produce something slightly different. 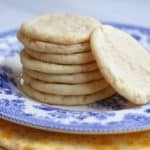 I think they are somewhat similar to my Butter Ricotta Cookies recipe in terms of flavor but they are very unique if you have never tasted them. All the ingredients are ones you can typically find in the everyday pantry; making these cookies both accessible and hassle free. I encourage you to also take this recipe and turn it into your own. While these cookies are delicious on their own, they also create the perfect canvas for additional flavor. I’ve tried so many different versions of Southern Tea cakes that use “a secret family recipe” and each one has tasted wonderful. There’s just no way you can go wrong. If you want to dress up my recipe, feel free to add cinnamon, nutmeg, or even lemon zest; but, before you do, I recommend trying the recipe in its traditional form. Then you can build it up just the way you’d like! This vintage recipe is one of my favorites because the texture is how the originals were made. The ones I grew up eating time and time again. I plan on passing this recipe down for years to come because I believe in the importance of traditions.They truly shape who we are in a way that most things can’t. They end up defining our ideals. Now that I am a mother, I continually think about the things I am choosing to pass down to my daughter. Recipes carry stories with them; they are easily preserved and capable of nurturing beautiful family moments. I simply can’t wait to one day hear their memories of the special occasions and times we have shared with these traditional Southern treats. 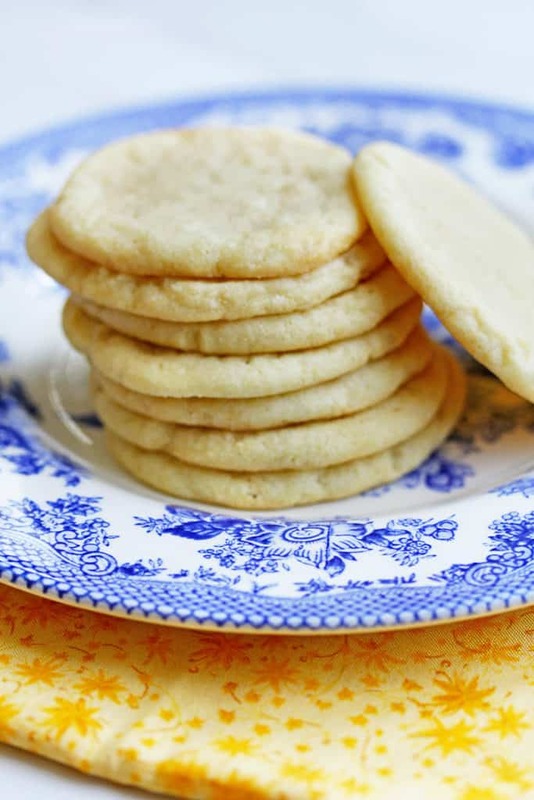 I have lots of cookie recipes that are just as old fashioned as these. For instance my Soft and Chewy Chocolate Chip Cookies are a favorite here on the blog that I know you will adore. The best (and easiest) Southern Tea Cakes Recipe (or tea cake cookies recipe) is here! You will feel like you are right in the South after making and serving these, not to mention eating them. In a medium sized bowl, whisk together the flour, salt and baking soda and set aside. In the bowl of your mixer, add butter and sugar and cream together on high speed until fluffy and smooth (about 4-5 minutes). Turn mixer to medium speed and add in one egg and vanilla extract and beat until well incorporated. Lastly, turn mixer to slow speed and add in flour mixture in intervals of three beating after each addition to incorporate. After dough is well mixed, turn off mixer and remove dough from mixer and add to a ziploc bag and place in your refrigerator for at least one hour to firm up dough. Once dough is firm, remove from fridge and preheat your oven to 325 degrees. Taking a measuring tablespoon, scoop out cookie dough the size of the tablespoon and roll into a ball. Using your thumb, gently press the center to flatten a bit and place on the tray. Do the same for the rest of the dough leaving at least an 1 1/2 inches between each dough ball. Bake for 9-11 minutes until golden brown on the edges and remove from the oven. Cool for 5-10 minutes and serve. This is a delightful recipe. Both my mother’s family made their recipe and my father’s Tante Terese had her own. These cookies baked up in wood-fired stoves as well as they do in electric ovens and lasted in the high humidity w/o problems. They were kept in pantries in various containers that were not airtight and were always delicious. Etiquette (visiting) dictated 2 only per person. However, at home my mother made large versions and we could have more than 2/day, if they were in the house. Once my sister and I used duck eggs to make the recipe and had to double all the ingredients b/c the duck eggs are so much larger than chicken eggs. Fortunately, my mother did not find out why we had so many cookies. However, her finely tuned taste buds knew there was something different. Thanks for the good memory. My grandmother passed in 1987 and the last time I remember her making them with nutmeg was in the 60s. About 10 years ago my mother tried to remember how they were made & I tried it but they weren’t quit right. I will use your recipe and add nutmeg for my familiar back in the day memory. Thank you. Oh wonderful Sondra. I hope they are delicious to you and bring back wonderful memories. Thank You I have been searching for this recipe. I think this is it. Thank you so much!!! Just make sure to double if you want a larger quantity. How would I go about making a red velvet version of these? I wouldn’t change the recipe but you could add a little cocoa powder and a bit of red food coloring. My grandmother ALWAYS made them with real Bananas which was the best part to me. This recipe is perfect. I agree- Tea cakes are important to our Southern Heritage. I think I will make some this weekend. I had been asking for some for months, and my co-worker made some using this recipe. They were soooooooooo goood with my morning cup of coffee! Awww thank you so so much!!!! I’m so glad you enjoyed them. This recipe is perfect. I agree- Tea cakes are important to hour Southern Heritage. I think I will make some this weekend. I had been asking for some for months, and my co-worker made some using this recipe. They were soooooooooo goood with my morning cup of coffee! I’m so glad you love these! I love them! Oh gosh what a fantastic story. LOL. We have almost the same memory. My grandmother would come in from either picking cotton or from feeding the cows to cook supper and of course back then, they never failed to cook something sweet. On Sundays, it was usually a huge cake or pie made from scratch but during the week or saturdays it was Tea Cakes. Hers were the best because she used bananas. It’s been over 40 yeas and I still crave them. I can’t see the measurement for the amount of cream. Cream is mentioned with blending the butter and sugar. Yes no actual cream is in the recipe. To cream means to mix in baking terms. I love your recipe for southern tea cakes, I misplaced the recipe and I asked my co-worker to help me find it on Pinterest. After a couple of hours, she found the recipe and decided to follow you. Thank you for posting this recipe, I just love this tea cake recipe with a lemon glazed drizzles on top. Wonderful! I’m so glad you found me! Thanks for following me! Just tried these, and I love ’em! Been looking for a good recipe for a while. And these are so easy! Hooray I’m so so glad! I hope you enjoy them Karen! I made these tonight because I wanted to bake something sweet, without having to buy additional ingredients. They are delicious and taste just as you described. Mine were a bit thicker than yours, but it may be because I used too much dough or because I used a medium egg, instead of a large one. These were easy to make and my husband was pleasantly surprised by the homemade treat. Thanks again for this wonderful blog. Great memories! My Grandma was a wonderful cook & baker. She made tea cakes every year for Christmas. They are so simple, yet so delicious. omg, love these! elegant and perfect. . can’t wait to try! Thanks so much hon! I love that they are elegant! Thank you so much Sarah! These are actually perfect with a cup of tea! Or served alone. Thanks so much Sasha. I think I might be right there with you! How did I miss these? They look perfect for tea time, or anytime! Love the name too! They are fantastic. They are seriously one of my favorite things ever. I don’t think I’ve ever had tea cakes, but I know I’d love them. Cakey cookies are always some of my favorites. Hmmm! This Northerner has never had a tea cake but these look super tastyy! It’s so cool how traditions are handed down and also how they can vary between a couple hours! Indeed! I’m from Chicago and we never talk about tea cakes. I only hear about them in the south. Thank you so much Diana. They are awesome. I will check out your blog now! Thanks for stopping by. Same here Pamela, Same here!! I don’t think I’ve ever had tea cakes but they look really good! I was just talking to my husband yesterday about how different food is for different areas of the US. It is really interesting! I LOVE Tea cakes and this recipe is the way i’m used to them! Yes! I think I might post the other recipe that uses molasses at some point as well just for the comparison. I love your vintage recipes! And what an interesting story about even though they lived so close together, their recipes are so different. Fun!! It is so interesting to me, even today! Thanks for stopping by Renee! Same here Tonia! I will try to get that recipe and post it as well! Did you ever try the tea cakes with molasses? My mom told me to omit the sugar and use syrup instead since I did not have molasses on hand. This is how she always made hers. Hi Feleshia, my dad’s side of the family made tea cakes with molasses but I never tried it like that. It is definitely on my list of things to try this year! Let me know how yours turn out! It would be even better if you posted a pic on my facebook wall so I can see your gorgeous teacakes! They are the best thing ever! I have never had a tea cake before, but these look amazing. Buttery and soft? You bet! And I love that plate! The blue is so striking! Yes they are buttery and soft! Yummy and thanks so much for the plate complement! I love all your stories. I so want this southern treat! Awww thanks so much Melissa. Lucky for me I have some dough left in my freezer! Thanks so much Zainab. They are quite lovely. I love learning about Southern traditions, particularly when it comes to food. I feel like I’m missing out; I don’t think I’ve ever had a tea cake like this. I can picture them on a special occasion and I imagine it’s wonderful with some tea in the afternoon. Thanks for sharing your recipe. It is absolutely wonderful with tea Monica. You totally didn’t miss out. Tea cakes are a big deal to my Southern grandma, too. All my brothers love her version best! These look so good! Yes, Tea Cakes are a huge deal in the South right Mary!